Sub Zero's Factor 2 products are the perfect complement to their range of Factor 1 & Factor 1 Plus. Some of the best thermal gear available today. This snug fitting unisex long sleeve midlayer thermal has plenty of stretch (80% along the length, 30% along the length) which makes it feel as comfortable as a second skin and allows for a close comfortable fit for most body shapes. The long body length in combination with a drop back prevents any cold spots during activity. Set-in sleeves and contoured body panels provide a tailored fit that increases wicking efficiency and thermal efficiency. Thumb holes in the low profile cuff stops sleeves from riding up when extra layers are added and protects your hands from the cold. The stand-up double thickness turtleneck features a 18cm long zip that finishes just under the chin with a chin guard and wind baffle. 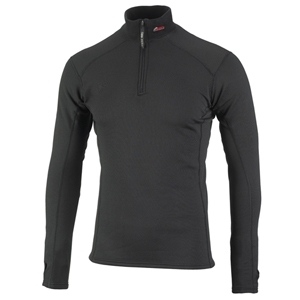 This is an ideal heavyweight midlayer thermal where extra neck protection is required but also giving you the option of venting yourself if you should overheat.